Gone are the days of the old pen-and-paper timesheet. We no longer work strict 9-to-5s, and many of us juggle side hustles or run our own businesses where keeping track of our time on the clock means getting paid our due. But even if you are a salaried worker in an office setting, understanding how you spend your time (which translates to your attention, which demonstrates your priorities) is one of the keys to unlocking productivity, cutting back on wasted minutes (or full hours), and walking away at the end of the day confident you achieved your goals. Not only are there great, affordable tools to help you keep track of billable hours or sort through time spent on different work-related tasks (business development, client meetings, deep work), but after a few weeks or months of tracking your time you will start to see trends in how you spend your time, what you might be wasting your time on, and which hours of the day you do your best work. But isn’t tracking my time more work than it’s worth? This is probably the biggest hangup we all have about time tracking: it takes effort, and it can be tough to see the payoff, especially in the short run. But tracking your time is worth so much more than making sure you capture all those billable hours (or aren’t overworking yourself without realizing it). One major benefit I’ve seen from time tracking is understanding and capturing “transition time.” From dinging notification to multiple browser tabs, to calls, emails and drop-bys from coworkers, we switch between tasks an astounding number of times each day. One researcher found the modern worker is interrupted 20 times each hour! By seeing how frequently I’m switching between tasks, I can start to see patterns and minimize transition time as much as possible. That might mean stacking meetings or phone calls and blocking out hours for deep work. By switching tasks less, I gain back minutes or sometimes hours each day. Okay, I’m convinced. But where do I start? There are countless tools that can help you track your time. Above all, don’t be afraid to try things out and find what works best for you. I’ve settled on two primary tools: the Zei time tracker and the Moment app (only available on iOS right now). The Zei is a handy gadget with 8 sides, and you can customize what each side represents. I use categories like “MatchPace,” “Family,” “Health,” and “Faith.” If you upgrade to the professional plan you can also use subcategories. For example, I use subcategories like “Admin,” “Business Development” and “Learning” for MatchPace, and “care and feeding” and “logistics” for family-related time. I have a separate side for Clients, and each client has a subcategory. Zei works best for desk-based jobs, because you physically flip it whenever you change from one task to another (if you use it, it’s really good for catching you in those mid-thought “this is too hard, why don’t I just look at the news instead?” moments). 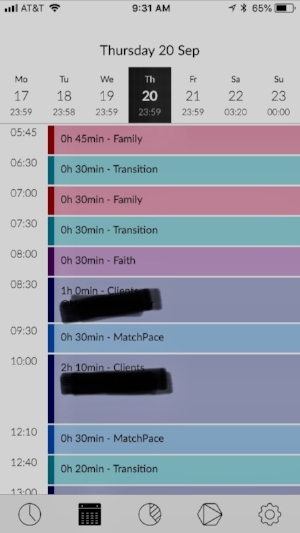 It doesn’t travel well, so it’s harder to work with when I’m moving between client meetings and school pickups, but I can manually enter my time later on (I find the desktop app easier than the phone app for entering time). From a practical standpoint, it makes it easy to track how much time I spend on each client and then generate and filter reports, making billing hours as simple as possible. 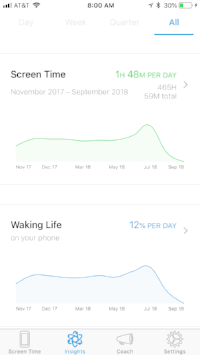 Moment is a fantastic app that automatically tracks how much time you’re spending on your phone. It keeps me honest about how much time I spend on social media (even if I didn’t happen to catch it with my Zei, b/c I was multi-tasking (like riding the metro, which is “transition” on my Zei; but I still want to know how many hours/week I’m scrolling through other people’s posts). It also has an alarm that goes off whenever I go over self-imposed time limits, it has already reduced the amount of time I spend with my nose in my phone. I get a handy report once a week that keeps me accountable for the time I waste without knowing it. Finally, but most importantly, make sure you know your “why.” Are you simply tracking your time to capture billable hours? Great - find a tool that works for you, and go for it! But time tracking can reveal whether how you spend your time truly reflects your values and priorities. We have endless ways to waste time and bury our heads in distraction, but those distractions aren’t always healthy. Is the way you’re spending your time aligned with your goals? If you wanted to run a marathon but never saw any exercise on your time tracker, you may need to shift your priorities or set a different goal. If you’re trying to start a business but your time tracker is dominated by Netflix and Instagram, you know you’re out of alignment. Information about how you spend you spend your time gives you the power to change your habits and achieve your goals. If you’re not sure how to start tracking your time, consider using these tools or find something that works for your job type and schedule. Give it a try, and make sure to stick with it for several weeks - time tracking gets easier the more it becomes a habit. Pretty soon, you’ll find freedom in how you spend your time and be closer to achieving your goals!